Halamski A. T., 2016. Seventh International Brachiopod Congress Nanjing, China, 22-25 May 2015. http://paleopolis.rediris.es/BrachNet/REF/Pub/halamski-2016.html. 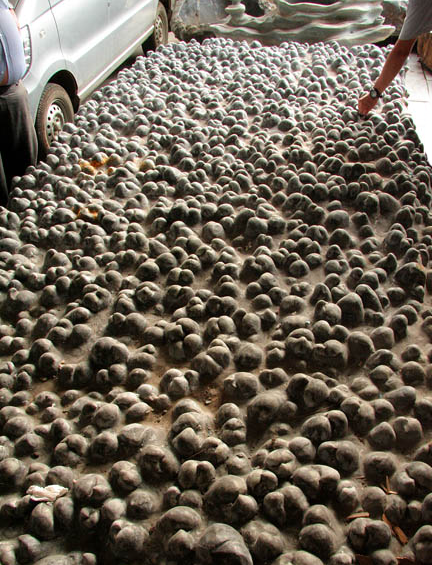 The Seventh International Brachiopod Congress took place in Nanjing, China from 22 to 25 May 2015. Brachiopod congresses have been held every five years since the first session in 1985 in Brest (France). The Seventh Congress was attended by 104 specialists from 19 countries, including 53 representing the host country, the People’s Republic of China. All other delegations were significantly smaller, Australia and Japan having five participants, Italy four, Canada, Germany, Poland, Russia, Spain, Sweden, Taiwan, UK, and USA three participants each, and Argentina, Mexico, and New Zealand two participants each. Denmark, Estonia, France, and Hungary were represented by single delegates. One of the opening lectures, given by Prof. Shen Shuzhong from Nanjing, was devoted to the history of brachiopod research in China. In several sections brachiopods are the only fossil fauna present, so their study has not only a purely palaeontological character, but has a practical, stratigraphic and cartographic aim. This is why Chinese brachiopodologists are so numerous. The first national brachiopod congress was held in China already in 1980 and Chinese researchers hoped the international congress to be held in their country one day. The subjects of the congress talks were evidently quite diverse, but two topics were treated especially often: the earliest brachiopods and their Cambrian relatives as well as the PermianTriassic extinction. More generally, it is worth noting that out of 50 presented talks most were devoted to Palaeozoic and modern brachiopods, whereas students of Mesozoic and Cainozoic are nowadays few (only six talks in total). The Cambrian faunas were studied above all by Lars Holmer from Uppsala and Zhang Zhifei from Xian who authored or co-authored six communications during the congress (Brock et al., 2015; Li et al., 2015; Topper et al., 2015; Wang et al., 2015; Zhang & Holmer 2015; Zhang & Zhang, 2015). This reflects significant progress in our knowledge about the origin of brachiopods. 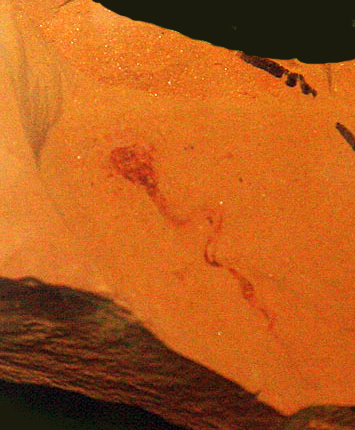 Yuganotheca, an early Cambrian fossil from Chengjiang, possessed a shell composed of two agglutinated valves and probably represents an evolutionary link between phoronids and brachiopods (Li et al., 2015). Five talks were devoted to the PermianTriassic extinction (Chen et al., 2015a; Chen et al., 2015b; Garbelli et al., 2015; Tu & Chen, 2015; He et al., 2015). Large datasets were analysed by statistical methods. Some trends do appear, but in some cases the obtained results might seem disproportionate to the degree of complication of the mathematical apparatus. Geochemistry was also one of the much discussed topics. In a keynote lecture Brand (2015) stressed that in the Palaeozoic brachiopod shell is the best source of geochemical data. Brachiopods are better for that effect than, for example, conodonts, because the latter are extinct, so their physiology remains unknown. Zaky et al. (2015) showed that different methods of shell cleaning before an analysis for rare earth elements resulted in very different results being obtained. The congress was attended mainly by palaeontologists, but students of recent brachiopods were present as well. Robinson (2015) presented a systematic revision of Novocrania in which he documented an unusual intraspecific variation pattern, potentially a tool for the interpretation of fossil samples. The first brachiopod genome has been recently sequenced (Lingula anatina: Luo et al. (2015). The communications presented during the congress testified to a significant technical progress realised during the last ten years thanks to improvements of X-ray micro-computed tomography (abridged µCT). During the plenary discussion closing the 2005 Copenhagen congress someone asked whether X-ray tomography can be used for investigating internal structures of brachiopods. “It has been tried, but it failed” was the answer. At present, µCT is becoming an increasingly popular method, in several cases replacing the standard serial sections. The advantages of this method are evident: it is non-destructive, has greater resolution, and can be easily applied to silicified material. One should not forget, however, that the disadvantages of this method are the non-visualisation of growth lines, limitations in sample size, and very high cost of a single analysis. The µCT has already allowed discovering the complicated spatial arrangement of spicules within the brachiopod body, the arrangement being destroyed when using a different method of studying the interiors (Lüter & Seidel, 2015). During the final meeting the delegates voted on the time and location of the next session of the congress. It has been decided that next sessions will be held every three years (instead of five) and that the next one is to take place in Milano in 2018. After the plenary session some delegates participated in the fieldtrips to the Palaeozoic sections of south and east China (Devonian and Carboniferous of Guangxi, Cambrian of Chengjiang, Ordovician and Permian of Anhui and Jiangxi). I have taken part in the Guangxi trip and thanks to it was able to realise how difficult is the fieldwork in subtropical areas. Already at the end of May the temperatures reach 30°C with ambient humidity about 100% and after strong rains routes have to be cleared out or even repaired due to landslides. The mean speed on a highway is thus about 30 km/h. The Nanjing congress was very well organised. For example, even if the number of participants was greater than that in Melbourne in 2010, it has been possible to avoid parallel sessions. The museum of the Nanjing Institute of Geology and Palaeontology of the Chinese Academy of Sciences with its rich collection of the Chengjiang fauna was kept open for the delegates until late evening. The abstracts of the 7th congress were published as a special issue of the “Permophiles” (Huang & Shen, eds, 2015) and the post-congress volume is scheduled to appear as a special issue of the “Palaeoworld” (11 papers online, 2016 ). The publication of a compendium entitled “Phanerozoic brachiopod genera of China” has also been announced (Rong, 2015). Brand U., 2015. Trace and isotope chemistry of brachiopods: proxies of geologic events Permophiles, 61 (Suppl. 1), 7-9. Brock G., Betts M.J., Holmer L.E., Skovsted C.B. & Popper T.P., 2015. Lower Cambrian brachiopod assemblages from east Gondwana - biostratigraphic review and correlation. Permophiles, 61 (Suppl. 1), 9-11. Chen J., Tong J., Song H., Luo M. & Huang Y., 2015a. Recovery pattern of brachiopods after the Permian-Triassic crisis in South China. Permophiles, 61 (Suppl. 1), 18-20. Chen Z., Wang J., Yang H., Tu C. Polov, Y. & He W., 2015b. Permian-Triassic evolutionary dynamics of the Brachiopoda: paleobiogeography, extinction-survival-recovery, latitudinal diversity gradients, body size variation, and longevity changes. Permophiles, 61 (Suppl. 1), 20-21. Garbelli C., Angiolini L., Brand U., Shen S., Jadoul F., Posenato R., Azmy K. & Cao C., 2015. Neotethys seawater chemistry and temperature at the dawn of the latest Permian events. Permophiles, 61 (Suppl. 1), 29-30. He W., Shi G.R., Zhang Y., Yang T., Zhang K., Wu S., Niu Z. & Zhang Z., 2015. Changhsingian (latest Permian) deep-water brachiopod fauna from South China. Permophiles, 61 (Suppl. 1), 41-43. Huang B. & Shen S. (eds), 2015. The Brachiopod World. Abstracts for IBC 7. Permophiles, 61 (Suppl. 1), I-VII, 1-112. Li G., Zhang Z. & Holmer L.E., 2015. Early Cambrian stem-group brachiopods from China. Permophiles, 61 (Suppl. 1), 54-55. Luo Y., Takeuchi T., Koyanag R., Yamada L., Kanda M., Khalturina M., Fujie,M., Yamasaki S., Endo K. & Satoh N., 2015. The brachiopod genome of Lingula anatina and the evolution of lophotrochozoans and biomineralization. Permophiles, 61 (Suppl. 1), 57. Lüter C. & Seidel R., 2015. Peeping through a bivalved shield - non-destructiveX-ray micro-computed tomography (μCT) elucidates brachiopod internal anatomy. Permophiles, 61 (Suppl. 1), 60. Robinson J., 2015. A review of extant species in the craniid brachiopod genus Novocrania. Permophiles, 61 (Suppl. 1), 73. Rong J., 2015. Phanerozoic brachiopod genera of China: A brief introduction. Permophiles, 61 (Suppl. 1), 73-75. Topper T.P., Strotz L., Holmer L.E. & Caron J.-B., 2015. Water above and mud below: life strategies of brachiopods from the middle Cambrian Burgess Shale. Permophiles, 61 (Suppl. 1), 92-94. Tu C. & Chen Z., 2015. How did bivalve take over brachiopod’s governorship over the Permian-Triassic transition? An old question with new insights. Permophiles, 61 (Suppl. 1), 95-96. Wang H., Zhang Z. & Holmer L.E., 2015. New observations on the most mineralized brachiopod Diandongia from the Chengjiang Lagerstätte (Cambrian, Stage 3) of eastern Yunnan, China. Permophiles, 61 (Suppl. 1), 96. Zaky A., Brand U. & Azmy K., 2015. A new sample processing protocol: an important update for procuring reliable ree signatures. Permophiles, 61 (Suppl. 1), 97-98. Zhang Z. & Holmer L.E., 2015. Exceptionally preserved brachiopods from fossil-Lagerstätten in southwestern China: perspectives on the Cambrian explosion of metazoans. Permophiles, 61 (Suppl. 1), 104-105. Zhang Z. & Zhang Z., 2015. 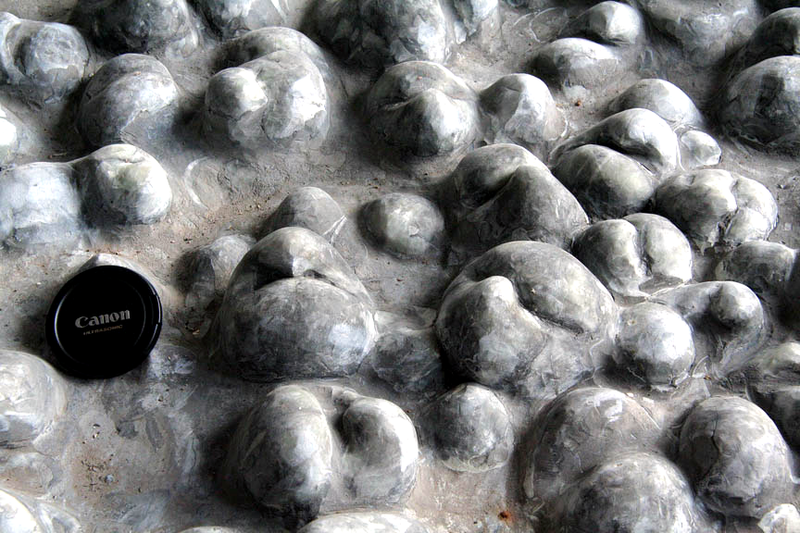 The epithelial cell moulds on the shells of the earliest acrotretoids from the Cambrian Series 2 (Shuijingtuo Formation) in the Three Gorges area, China. Permophiles, 61 (Suppl. 1), 106-108. 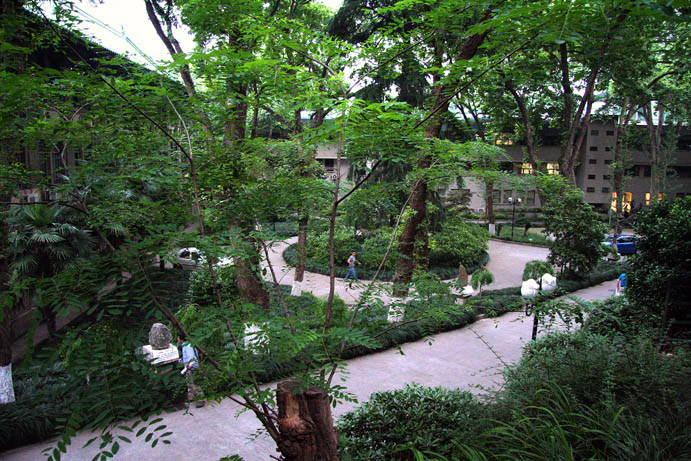 The courtyard of the Nanjing Institute of Geology and Palaeontology of the Chinese Academy of Sciences. Photo by A.T. Halamski. 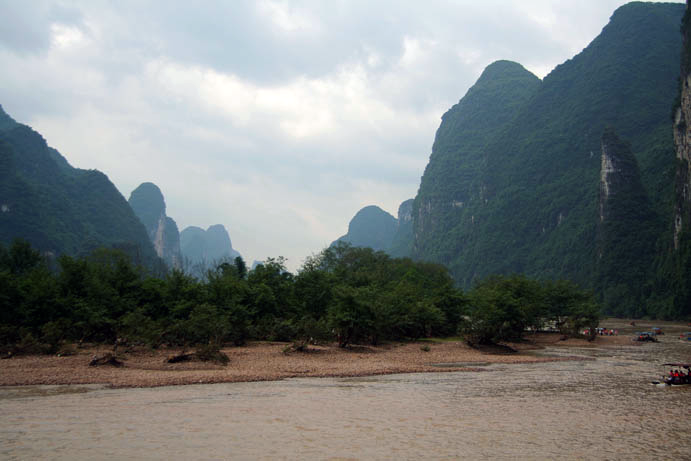 Tropical karst landforms developed in Upper Palaeozoic limestone in the Li (= Lijiang) valley between Guilin and Yangshuo (Guangxi province). Photos by A.T. Halamski [2a] and A. Balinski [2b]. Early Cambrian brachiopod Lingulella chengjiangensis from the famous locality of Chengjiang (Yunnan province). Both shell and pedicle, total length about 5 cm, are visible. Museum of Palaeontology (Nanjing Institute of Geology and Palaeontology of the Chinese Academy of Sciences), Nanjing. Photo by A.T. Halamski. Miocene proboscidean Serbelodon sp. 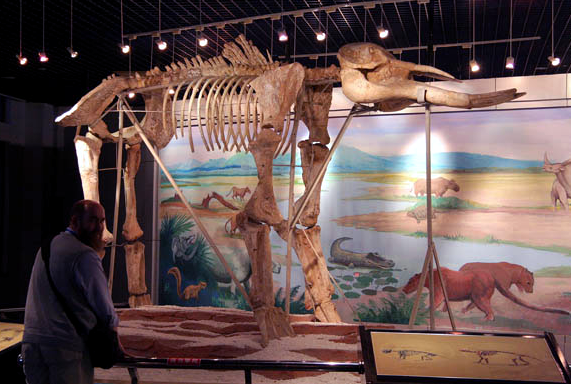 (Gomphoteriidae) from Nanjing region and A.T. Halamski for scale. Museum of Palaeontology (Nanjing Institute of Geology and Palaeontology of the Chinese Academy of Sciences), Nanjing. Photo by U. Jansen.